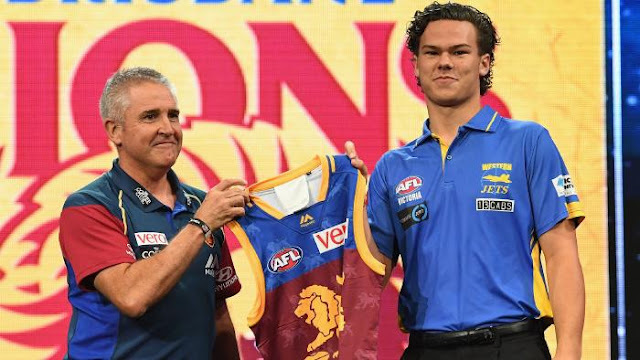 IN AN an unpredictable draft, Pick 1 went to plan, with the Brisbane Lions selecting powerful on-baller Cameron Rayner. However Fremantle sprung a surprise with the next selection, picking up Sandringham gun Andrew Brayshaw ahead of Adam Cerra and Luke Davies-Uniacke at the second selection. Rayner, a Western Jets on-baller, was widely tipped to claim the No. 1 mantle, so it came as no surprise when the Lions called his name first at Friday night’s draft meeting in Sydney. Rayner has won rave reviews for his strength at the contest and ability to go forward and kick a goal, which has resulted in him being likened to Richmond superstar Dustin Martin. “I’m just really excited and happy to be a part of the Brisbane Lions,” Rayner said. “I think it’s such a big honour seeing some of the players that have been before me (at No.1). I’ve got some big shoes to fill. Fremantle snapped upBrayshaw with the second overall selection, while Carlton claimed Bendigo Pioneers onballer Paddy Dow with the third overall selection. Dandenong Stingrays midfielder Luke Davies-Uniacke went to North Melbourne fourth overall, while the Dockers rounded out the top five by taking Eastern Ranges onballer Adam Cerra. Some clubs were unsure how a minor heart condition would affect Eastern Ranges forward-midfielder Jaidyn Stephenson at AFL level but Collingwood were confident enough to use pick six on him. St Kilda had back-to-back picks at seven and eight and they snapped up midfielder Hunter Clark (Dandenong Stingrays) and defender Nicholas Coffield (Northern Knights). Thunder key defender Aaron Naughton went to the Western Bulldogs at nine and Bendigo Pioneers midfielder Lochie O’Brien went to Carlton at pick No.10. The AFL national draft will see the 18 clubs, whose recruiters have been hard at work for this night for more than a year, select their newest players. The draft is exclusively live on Fox Footy (channel 504), with live coverage beginning at 6:30pm before the draft itself gets underway at 7pm. It can also be streamed on Foxtel Now. The draft begins at 7pm. The top 10 picks will be presented with an AFL guernsey by their coach and will then be presented as a group on stage. After that, the rest of Round 1 will be completed, which is expected to finish at around 7:30pm. Rounds 2 and 3 will be next with a three-minute break after each round, while the remaining rounds will be completed with one group.